Emerging markets remain at the forefront of the world’s most vibrant and fastest-growing economies, with overall gross domestic product (GDP) growth rates comfortably in excess of the developed world this year, despite much-publicized slowdowns in certain countries. The Templeton Emerging Markets team believes the challenges faced by some countries, sectors and companies—such as energy firms and Chinese banks—have obscured interesting opportunities within the emerging-market (EM) space. Here, my colleague Chetan Sehgal, executive vice president, managing director India, CIO, and director of global emerging markets/small cap strategies at Templeton Emerging Markets Group, and I present the team’s views on the distinct opportunities we see in EM small-capitalization (small-cap) stocks. We believe small-cap stocks within EMs offer continued strong growth potential at attractive valuations. We also view the asset class as one that is overlooked by most investors—in part due to misconceptions regarding the volatility, liquidity and scale of this investment universe. There are several key positive attributes of EM small caps, both structural and tactical, which in aggregate we think support considering the inclusion of the asset class within a given exposure to EMs. From a structural perspective, smaller EM companies provide investors with exposure to thousands of companies that we have seen as having ample liquidity. Smaller companies are typically under-researched and under-owned by foreign investors, leading to market inefficiencies that potentially can be exploited. In addition, the types of exposures the EM small-cap space typically represent complements the EM large-cap space, particularly in areas such as the health care and consumer sectors, fueled by demographics and a rising middle class. As such, we believe EM small caps in aggregate can deliver strong growth potential. Tactically, we consider the recent selloff across EMs to have provided a particularly attractive valuation opportunity. In addition, smaller companies in EMs generally have greater local market exposure and as a result, have historically had reduced correlation (the degree they move in tandem) with their larger-cap counterparts. Like all EM equity investments (and equity investments generally), investing in smaller companies carries some inherent and perceived risks including loss of principal; smaller-company stocks have historically had more price volatility than large-company stocks, particularly over the short term. However, EM small caps are increasingly attracting institutional investor interest, and we think they offer attractive risk/return attributes in the current global economic environment. EM small caps are far from a niche investment, despite broad perceptions. The asset class represents more than 23,000 companies with an aggregate market capitalization of close to US$5 trillion1 and daily turnover of close to US$60 billion, constituting substantial proportions of overall emerging-market liquidity and market capitalization, as the chart below demonstrates. Accordingly, the sheer size of the EM small-cap investment universe provides abundant opportunities to uncover mispriced companies. Another aspect of the asset class (also highlighted in the chart) is that the aggregate liquidity is broadly comparable with that of large-cap stocks—again, contrary to common perception. 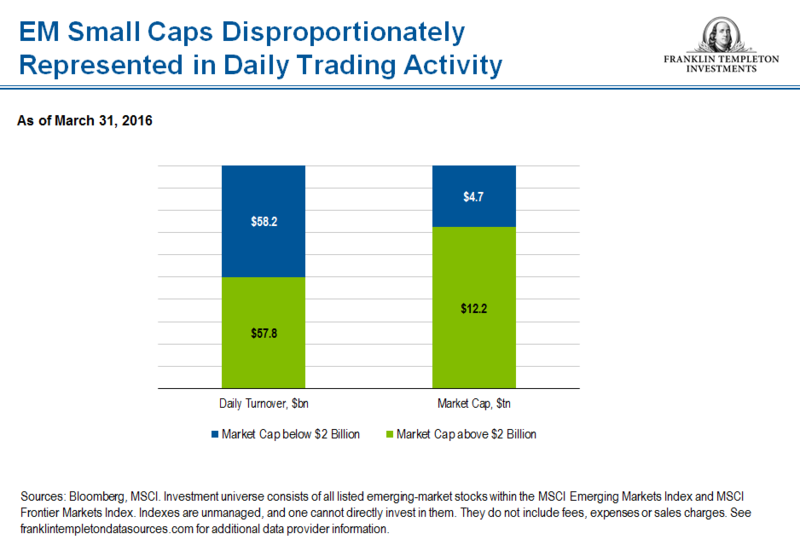 In fact, EM small caps are typically disproportionately owned by domestic retail investors who often trade more frequently than foreign institutional investors due to the former usually having a far shorter investment horizon, boosting liquidity as a result. In the next chart, we look at the level of EM small-cap exposure within the MSCI Emerging Markets Index, a benchmark widely used to represent EM stocks as an asset class. Here, we find that EM small-cap exposure amounts to only 3% of this benchmark—compared to 28% of the market capitalization of the entire EM investment universe.2 This difference represents a structural underweight in the portfolios of investors who follow an index-based strategy. Not only are smaller EM companies overlooked by many investors, they are also notably under-researched. This reflects not only the vast number of companies to cover, but also the paucity of information available and a limited investor base that such research can be distributed to. 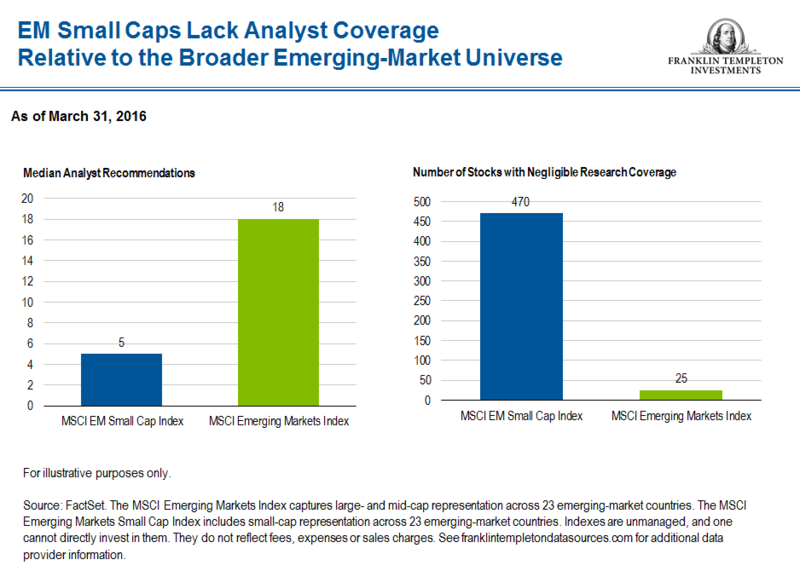 Unsurprisingly, the result is that the median number of research recommendations for EM small caps is far lower than for larger-cap EM stocks. Equally important to note is the vastly greater number of stocks with negligible, or effectively zero coverage. For a large number of EM small-cap stocks outside of the benchmark index, research availability is even more limited. The likelihood of a relatively unknown off-index EM small company stock being mispriced is far greater than for a large company with many research recommendations. Reflecting on the general long-term success of EMs as global economies and as an equity asset class, most of these countries have become ever more integrated into the world economy. Consequently, their largest and most successful companies have often expanded beyond domestic markets to export and invest globally. Accordingly, the share prices of many of these stocks are no longer primarily driven by domestic factors. Examples of such companies can include electronics, auto industry or consumer-related names that derive a substantial portion of their revenues from developed economies rather than those in which they are based. By contrast, smaller EM companies offer the very exposures that enticed investors to emerging markets in the first place, with domestic demand, favorable demographics, local reform initiatives and innovative niche products often being the primary determinants of growth. Consequently, the sectors to which EM small-cap investors are exposed differ notably from those of larger-cap stocks, as we can see in the next chart. 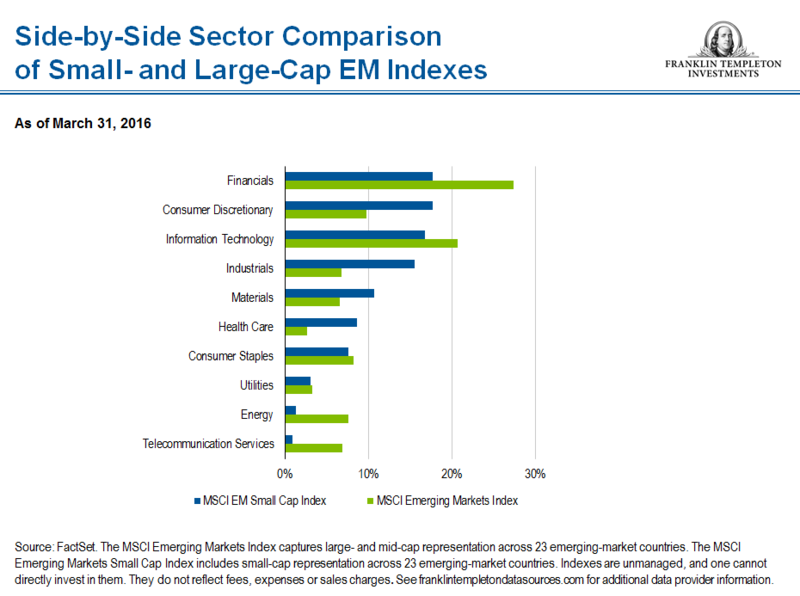 The MSCI Emerging Markets Index is disproportionately dominated by exposures in financials, energy, information technology and telecommunications/utilities. These sectors are typically more closely impacted by global or country-level macroeconomic trends—whether the debt associated with an economy’s property market, the global price of oil or government policies. Furthermore, there is a greater preponderance of state-owned enterprises among larger-cap stocks, and while we find many such state-owned companies to be well managed, the interests of the ultimate owners are not always entirely aligned with those of minority investors. EM small-cap exposures are concentrated in higher-growth sectors, such as consumer discretionary and health care. Such companies are typically more locally focused and many are relatively dominant players in smaller industries. The most successful smaller EM companies will leverage such local strength to expand internationally, supporting their transition into mid- or even large-cap companies over time. Even within a given sector, economic exposures can differ substantially. For example, in the materials sector, mining companies by their nature are generally large-cap names, and are impacted significantly by factors external to their home country, such as global commodity prices. Smaller EM materials companies likely include businesses, such as cement producers, with greater exposure to local economic development and demand dynamics. The predominantly domestic economic exposures of smaller EM companies, combined with these stocks being generally under-researched, results not only in mispriced individual companies at times, but also broader market-level inefficiencies. India is a notable economy that exhibits such trends, stemming from this market having a vast number of smaller companies in which to invest and a particularly pronounced skew in the ownership of these stocks towards local investors. We can use India as an example of how country-specific dynamics and other factors have resulted in non-correlated returns for investors. After the global financial crisis of 2008–2009 through 2014 calendar-year-end, flows into Indian equities were overwhelmingly from foreign investors, as domestic investors reallocated toward real assets such as property and gold. 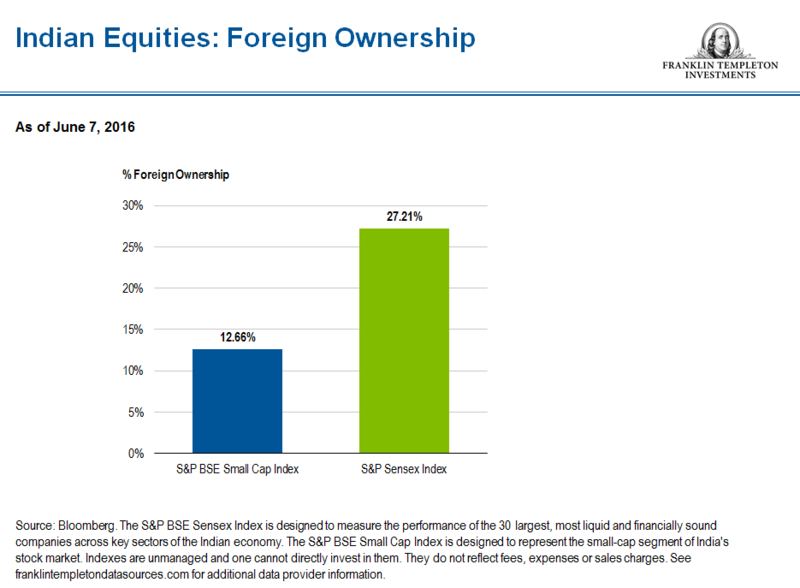 Any foreign inflows made through index-based investments will, by definition, be concentrated in the larger-cap index stocks, contributing to disproportionate foreign ownership of large-cap companies. This is further exacerbated by the limited research available for off-index or small-capitalization stocks, causing many investors to be similarly large-cap and index-focused. The next chart illustrates that investments held by foreign investors represent approximately 27% of the value of S&P BSE Sensex Index, representing the broader Indian equity market, but only 13% of the S&P BSE Small Cap Index.3 As a result, Indian small-cap stocks not only generally have greater exposure to the domestic economy through their business operations, but also through the behavior of local investors. Accordingly, from 2009 to 2013 the negative local sentiment towards equities contributed to a notable valuation discount of Indian small-cap stocks relative to their larger-cap counterparts, whereas in many countries smaller companies traded at a premium due to their superior growth characteristics. However, in 2014 sentiment changed as it became clear that the Bharatiya Janata Party (BJP) under the reformist and pro-business Narendra Modi was going to win the national elections, leading to substantial domestic inflows. This in turn led to a rapid rerating of valuations of Indian small-cap stocks, both relative to their large-cap counterparts and in absolute terms. In our view, emerging markets represent a potential bright spot in a sometimes-uncertain world economic landscape. General global growth rates have consistently disappointed since the 2008–2009 global financial crisis, with downgrades of International Monetary Fund (IMF) estimates each year—continued recently in April 2016 as the IMF reduced its estimated global GDP growth for 2016 down to 3.2%.4 In the six years prior to 2008, emerging markets contributed up to 70% of the increase in world economic growth annually,5 and despite some moderation since then, aggregate GDP growth rates remain considerably higher than those in developed markets. 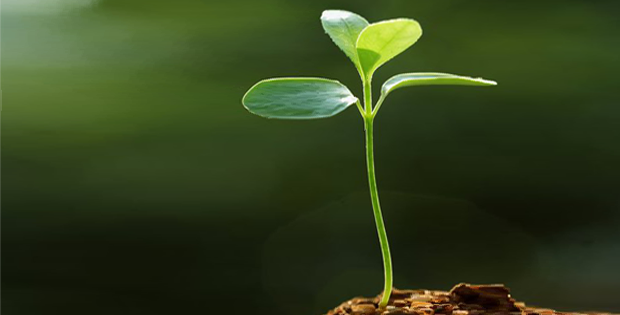 In such a low-growth world, investing in smaller EM companies may provide exposure to many of the fastest-growing companies in the fastest-growing countries globally. It is also worth reiterating that this growth is typically organic and derived from local market dynamics, rather than being driven by global macroeconomic factors or financial engineering in the form of share buybacks, as aggressively employed in the United States in particular and developed markets more broadly. In addition to organic growth, smaller EM companies may also see share-price appreciation from being added to an index (thus attracting passive investor flows, and with increased sell-side research attention likely attracting active fund flows also) as well as being potential merger-and-acquisition targets—these are growth drivers that are, to a great extent, independent of macroeconomic considerations. Having addressed misconceptions and some positive aspects of considering smaller companies within one’s portfolio, it is also important to consider the challenges. Perhaps what is most important to recognize is that there are numerous small EM companies that will remain small, whether due to corporate governance issues, poor quality of management, lack of market growth or other factors. Investors must seek to determine which of these companies will succeed over the long term. However, with such a vast number of under-researched and under-owned companies in which to invest, we think the case for small-EM company exposure looks compelling, given a focus on bottom-up fundamentals. All investments involve risks, including the possible loss of principal. Investments in foreign securities involve special risks including currency fluctuations, economic instability and political developments. Investments in emerging markets, of which frontier markets are a subset, involve heightened risks related to the same factors, in addition to those associated with these markets’ smaller size, lesser liquidity and lack of established legal, political, business and social frameworks to support securities markets. Because these frameworks are typically even less developed in frontier markets, as well as various factors including the increased potential for extreme price volatility, illiquidity, trade barriers and exchange controls, the risks associated with emerging markets are magnified in frontier markets. Stock prices fluctuate, sometimes rapidly and dramatically, due to factors affecting individual companies, particular industries or sectors, or general market conditions. Smaller company stocks have historically had more price volatility than large-company stocks, particularly over the short term. 1. Source: Bloomberg, as of 12/31/15. See franklintempletondatasources.com for additional data provider information. 2. Source: FactSet. The MSCI Emerging Markets Index captures large- and mid-cap representation across 23 emerging-market countries. 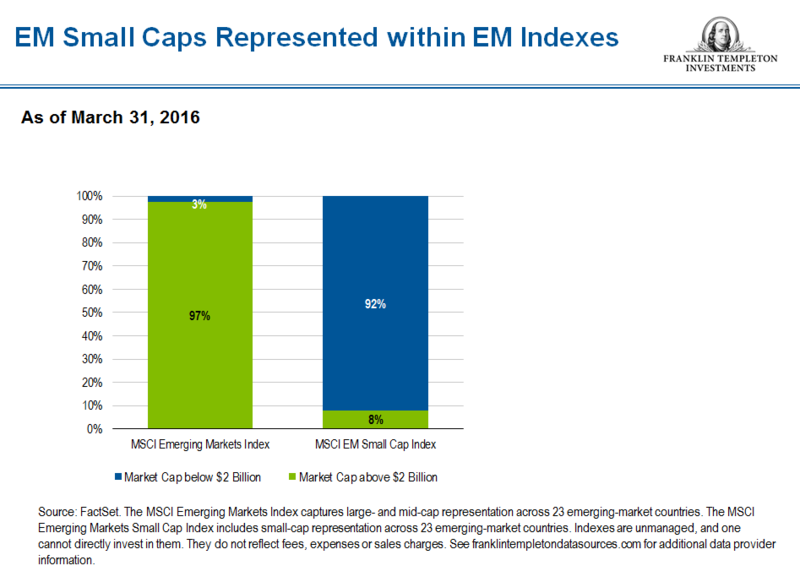 The MSCI Emerging Markets Small Cap Index includes small-cap representation across 23 emerging-market countries. Indexes are unmanaged, and one cannot directly invest in them. They do not reflect fees, expenses or sales charges. See franklintempletondatasources.com for additional data provider information. 3. Source: Bloomberg. The S&P BSE Sensex Index is designed to measure the performance of the 30 largest, most liquid and financially sound companies across key sectors of the Indian economy. The S&P BSE Small Cap Index is designed to represent the small-cap segment of India’s stock market. Indexes are unmanaged, and one cannot directly invest in them. They do not reflect fees, expenses or sales charges. See franklintempletondatasources.com for additional data provider information. 4. Source: IMF World Economic Outlook, April 2016. 5. Source: The World Bank, World Development Indicators, as of 5/2/16.